Budget airlines can be a source of frustration, but they can also be the source of a damn cheap vacation if you're willing to travel light. That's the case with a new sale from Frontier Airlines featuring $29 one-way tickets to loads of locations across the United States. In total, there are 68 routes with $29 tickets and 116 routes with one-way tickets for under $40. All-in, you can find round trip fares for as little as $98 if you're not a member of Frontier's "Discount Den" program. However, if you're willing to deal with the trials of budget airlines, joining Frontier's "Discount Den" club might be worth paying the $49.99 upfront cost to join the program. On a $98 round trip fare, you could save $40 on a single ticket if you're a member. Plus, you can purchase tickets for up to six people. The membership could pay for itself on your first pair of tickets. Of course, you have to be wary of the extra fees with a budget airline. 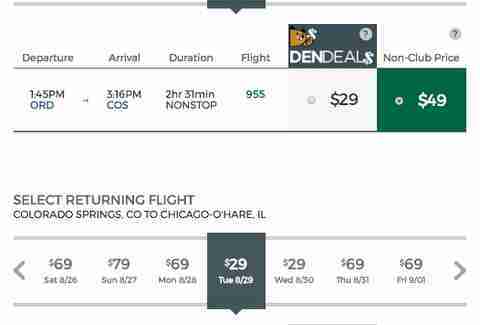 Frontier charges for checked bags ($25-35), carry-ons ($30-35), and seat reservations. Though, you can always skirt that by packing incredibly light and being willing to have your seat assigned at the airport. To take advantage of the deal, move quickly. Good deals don't last long.